Where, What, Who, How Much? 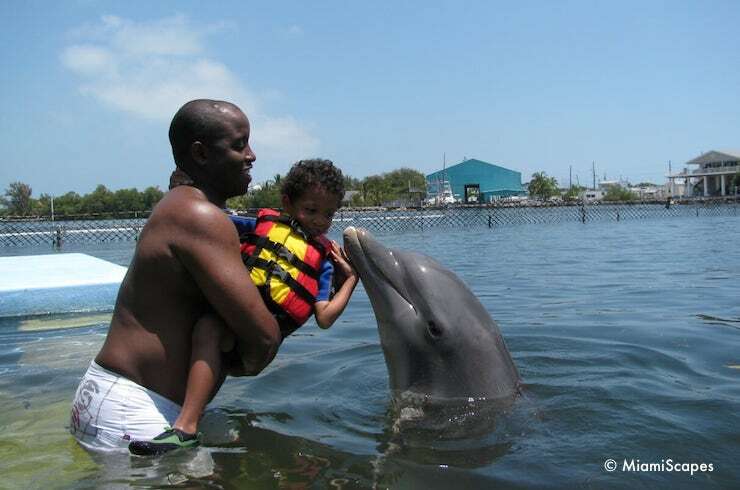 Swimming with dolphins was the highlight of our spring break a few years back. We have such wonderful memories, not only that, it was a great learning experience for the entire family. 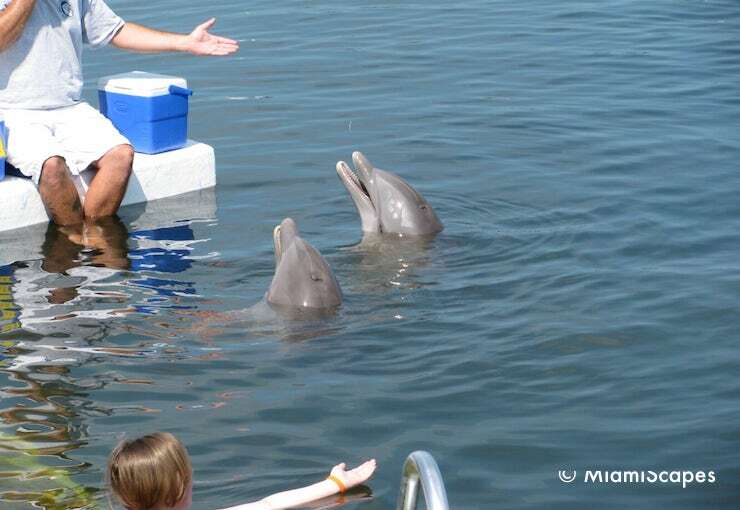 If you are staying in Miami, there are quite a few places in the city or a short drive away in the Florida Keys that offer an array of dolphin interactions and programs and there is bound to be something to choose from depending on your interests, ages of the participants, even swimming abilities. There are even programs for those that don't want to get in the water where you get to play, paint with and greet a dolphin and stay dry. What Is Involved In A Swim with Dolphins Program? There are different offerings, ranging from short 20-minute "play" sessions to a full-day of activities training and caring for the dolphins. 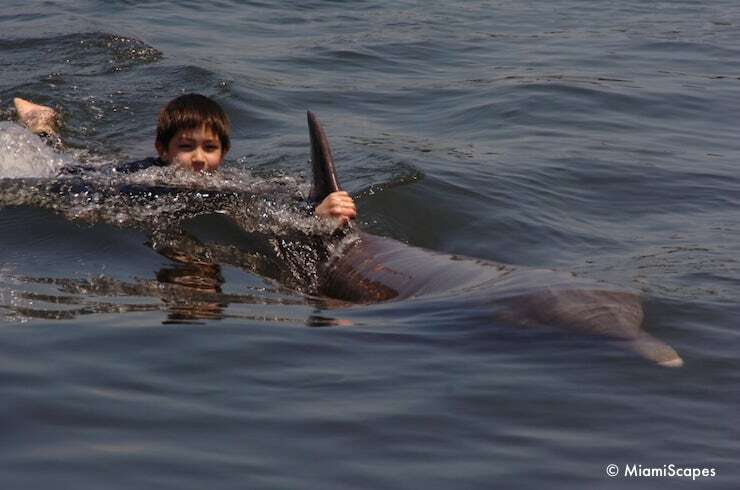 A typical "swim" will last about one-and-a-half to two hours including an educational briefing and very likely include, among other things, a dolphin kiss, a hand shake, a belly rub, some hand-signals, commands and tricks, and the favorite dorsal pull. For those that prefer something more natural rather than the structured interactions, places like Dolphins Plus in Key Largo offer swims where you snorkel or dive alongside the dolphins and learn more about the dolphins' natural behavior and abilities. Guests may observe natural behaviors such as nursing, vocalizations, hunting/fishing, and diverse social interactions within the pod. Yes, just about. Some places have age and/or height requirements for some of the programs, and even then, they will allow babies and toddlers when held by an adult. The list below, although not at all comprehensive gives you an idea of the selection of activities and age and height requirements if any. Of course it will depend on the program of your choice and can range from $60 for a "Play with a Dolphin" program to over $500 for the more comprehensive "Trainer for a Day" kinds of programs. Besides the cost of the program, also consider the photo fees which are optional but believe me, you will want to get them! Most of the places have their own photographers at the site and they do a marvelous job. There are many packages available, allow an extra $25 or so per participant. Of course in most cases you are also free to bring your own camera and snap away, or rather, whoever is not in the water can take the pictures. Also consider the cost of non-participants i.e. observers. At some places like the Dolphin Research Center, observers pay the cost of admission to the park, at the Miami Seaquarium they pay a bit more in addition to the general admission, at Dolphins Plus, there is no extra charge for observers accompanying participants in a dolphin program. See the below table to get an idea of the range of programs and their costs. Make reservations for the program of your choice, specially during weekend and holidays when the programs tend to fill up quick. If you come without reservations, arrive early and try for one of the "walk in" programs at the Dolphin Research Center. See below. The TripAdvisor community rates DolphinsPlus highly, here's what they have to say.